General Hydroponics Exile Insecticide / Fungicide / Miticide is OMRI-listed for use in organic gardening and an EPA-registered fungicide. That means one product gives you control of listed pests and diseases (e.g. soft-bodied pests and powdery mildew) in vegetable gardens, landscapes and greenhouses. 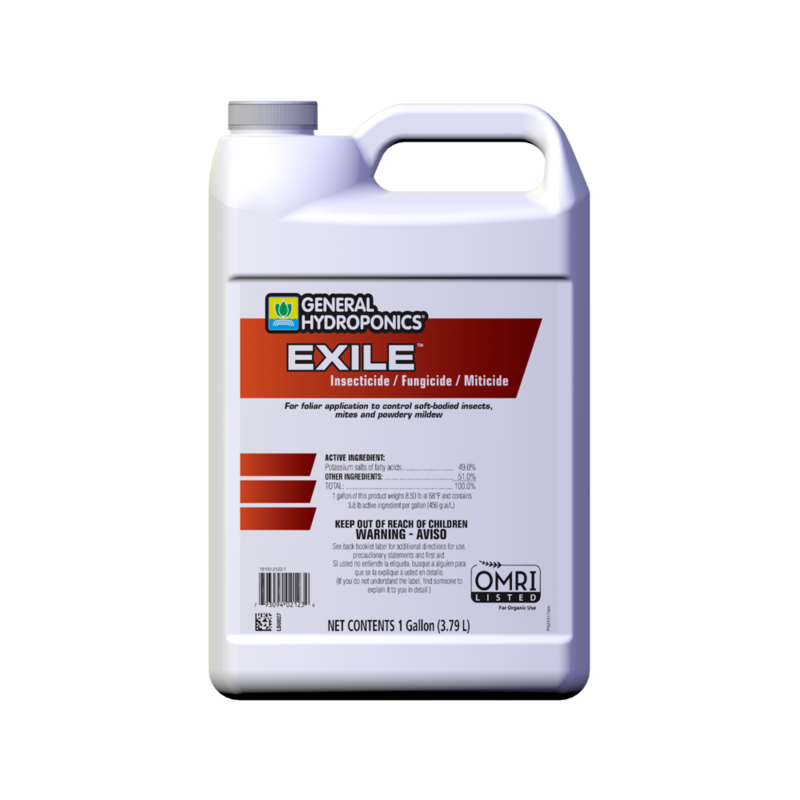 General Hydroponics Exile™ Insecticide / Fungicide / Miticide is OMRI-listed for use in organic gardening and an EPA-registered fungicide. That means one product gives you control of listed pests and diseases (e.g. soft-bodied pests and powdery mildew) in vegetable gardens, landscapes and greenhouses. The formulation is based on potassium salts of naturally derived fatty acids. General Hydroponics Exile Insecticide / Fungicide / Miticide provides control of mites, aphids and whiteflies. Once you see a bug or two — or after they've already become a bigger problem — you can apply this product to control or suppress their population. It can be used right up to harvest on vegetables, grapes and other small fruits, tobacco*, shrubs, foliage and flowering plants. General Hydroponics Exile Insecticide / Fungicide / Miticide may be used as part of an integrated pest management (IPM) strategy that also includes prevention-focused products such as General Hydroponics Prevasyn Insect Repellant / Insecticide and General Hydroponics Defguard Biofungicide / Bactericide. Plus, General Hydroponics Exile Insecticide / Fungicide / Miticide works nicely when tank-mixed with Azamax, another General Hydroponics product for pest control. Find a store near you that carries Exile.